Your appellate brief offers your best, and often only, opportunity to convince the justices to rule in your client’s favor. A well-crafted brief will frame the facts and legal issues of a case in the manner most favorable to your client; will educate the justices about the relevant facts and law; and will lead them, inexorably, step by step, to the desired result. With more than two decades’ experience in drafting appellate briefs, I can assist you in preparing your brief. If you don’t regularly do appellate work, or just lack the time to prepare a complex brief, consider outsourcing the research and writing to me. 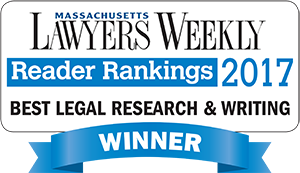 Unlike some who offer this type of service, I’m a local attorney, licensed to practice in Massachusetts, and can meet personally with you to discuss your project. Oversee copying, binding, service and filing of your brief. Editing the brief you write. Throughout the process, you retain control, determining the extent of my services and approving all documents. Benefits of outsourcing your appellate brief. maintain your relationship with your client, with whom I have no contact. What attorneys say about my services. Roger excels at writing appellate briefs and difficult dispositive motions and oppositions. I trust that work assigned to him will be done on time and will meet the highest professional standards. In short, a project given to Roger is one I don’t need to worry about. In addition to being an excellent researcher and writer, Roger is often able to bring clarity to confusing situations. He can dissect a factually complex case into well defined legal issues addressed by convincing, well supported arguments. Roger is also well versed in both the trial court and appellate rules. Roger has done work for me on a wide range of legal issues, from wrongful death to the Truth in Lending Act. In every case, he has added value and benefited my client. For example, I recently worked closely with Roger on a complex case in which a commercial landowner claimed a prescriptive easement over an abutting owner’s property. Roger drafted motions for and oppositions to summary judgment. As mediation approached, facts were discovered which were significantly different than those which the parties had assumed in their summary judgment papers. 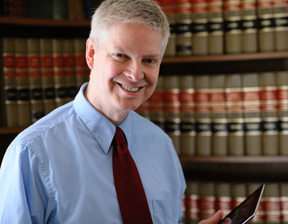 Roger quickly understood the significance of the new facts to my client’s legal position, crafted some entirely new legal arguments, and helped me settle the case on very favorable terms for my client. Roger is an absolute pleasure to work with and I recommend him without reservation. He is the best legal researcher and writer I have encountered in my 19 years of practice." Please contact me to discuss your appellate brief. I’ll respond as quickly as possible! Visit our Resources page to learn more about appeals to the Massachusetts Appeals Court and the District Court Appellate Division, including appellate procedure and other appellate issues. Please consult our FREE resources. Brief in Opposition to Petition for Certiorari, Supreme Court of the United States. Brief in Opposition to Petition for Certiorari, arguing that the Court of Appeals for the First Circuit had correctly applied the Parratt-Hudson Doctrine to bar the plaintiff Assistant Deputy Superintendant's procedural due process political discrimination claim. Appellate Brief, Massachusetts Appeals Court. Brief of appellee, arguing that appellants had not acquired an easement by prescription, easement by necessity or easement by implication to use pathway crossing appellees' house lot. Opposition to Motion for Summary Judgment, Massachusetts Superior Court. Opposing homeowner's motion for summary judgment on personal injury claims of plaintiffs, employees of an independent contractor hired by homeowner to construct home, who were injured when scaffolding collapsed. Opposition to Motion for Summary Judgment, Massachusetts Superior Court. Opposing insurance company's motion for summary judgment, which argued that its insured was not responsible for injuries suffered by the plaintiff, a social guest at the insured’s condominium, when plaintiff was attacked by the insured's former boyfriend. Opposition to Motion for Summary Judgment, Massachusetts Superior Court. Opposing corporate employer's motion for summary in personal injury action arising from auto accident between corporate employee and plaintiff, caused by employee's negligence. The primary issue was whether the employee was acting within the scope of employment when the accident occurred as he was driving home from work but arguably was still on the employer's premises. Motion to Dismiss, United States District Court for the District of Massachusetts. Seeking dismissal of claims of borrower against foreclosing lender. Office Memorandum regarding whether water and sewer pipes crossing landowner’s property are de minimis encroachments.